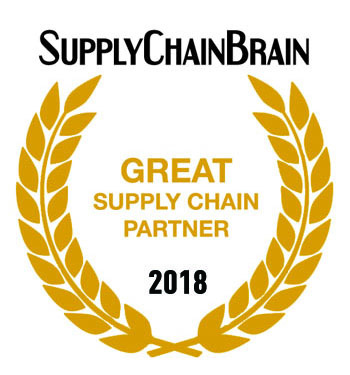 HICKORY, NC (October 1, 2018) – Transportation Insight, a global Enterprise Logistics Provider, is recognized as a 2018 Great Supply Chain Partner by SupplyChainBrain. Transportation Insight creates technology-based, multi-modal logistics solutions for more than 1,500 manufacturers, retailers, e-tailers and distributors throughout North America. Awarded annually, the Great Supply Chain Partner designation spotlights nominated enterprises whose client service not only fulfills a critical business need, but also cultivates a relationship that proves fruitful for all parties. Transportation Insight’s Co-managed Logistics® approach, combined with its blended platform of highly rated commercial and proprietary technology applications, enables its supply chain strategists to work alongside client partners to implement initiatives revealed through data-driven business intelligence. At a time when e-commerce plays an increasing role in the North American economy, Transportation Insight’s robust Insight Parcel® platform offers audit, engineering and advanced analytics to help small-package shippers align their processes with strategies that improve customer experience. Leveraging Insight TMS® and Insight Freight®, along with mobile interactive business intelligence portal Insight Fusion®, Transportation Insight creates streamlined processes that enable clients to accelerate profitable performance across their enterprise. Further, Transportation Insight’s lean-based methodology applies a continuous improvement mindset and supply chain analytics to help clients maintain performance gains and identify new opportunities for improvement. Transportation Insight’s recognition as a Great Supply Chain Partner is featured in the October 2018 issue of SupplyChainBrain magazine. SupplyChainBrain, the world’s most comprehensive supply chain management information resource, is accessed year round through a wide range of ever evolving multi-media formats by hundreds of thousands of senior level industry executives. In addition to addressing the fundamental principles of supply-chain management, SupplyChainBrain identifies emerging trends, technologies and best practices, forward thinking ideas and cutting-edge solutions and continues to write and report about these as they evolve and mature.